ASTM A369 Carbon Steel Pipes that we manufacture, export and supply conform to all industrial standards. We deal in Carbon and Ferritic Alloy Steel Forged and Bored Pipe. Our Carbon Steel Pipes can easily withstand corrosion, abrasion, extreme temperature and chemicals. 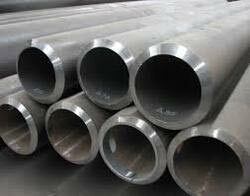 We provide these pipes in diverse lengths, thicknesses and grades to meet the needs of buyers. Moreover, our Carbon Steel Pipes are reasonably priced.